hiya, thanks for the feedback. I'm pleased you enjoyed it! There are a couple of bugs we're working on fixing at the moment, and we'll definitely take you're comments on board. You are supposed to click the guess button with the mouse, but we will investigate what is going on with the enter button! that's for the comment 😊 I'm really like the idea of making the game more educational. I really liked this game! The sounds and the art were really nice and gives the game a nice charm to it, and the game itself was a lot of fun to play. - Sound effects for each kind of guess, one for too high and one for too low, with perhaps a visual of some sort (such as a flash, or even better, animations of the wizard signaling with his hand and body language). - When I press "Enter", I lose a life but the guess indicator doesn't show until I press the "Guess" button. You should handle both cases as some people may find it more convenient to press the "Enter" button to submit a value from a text field. 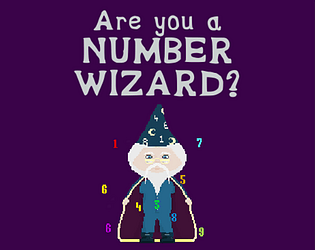 On a side note the apprentice wizard has only 11 possible numbers and you give the player 10 guesses which is far too many. Thanks for the feedback, we will keep these tips in mind when making it, and the Enter thing is a bug that two people have reported, it will be looked into on future releases. Congrats for finishing the game! I liked the wizard and how it almost looks like he is going to flash the player, but it instead just explodes in numbers. Note - if you press enter after typing in the number, it just disregards the number that you type and doesn't give you any higher/lower feedback. I almost won the final level but pressed enter and lost that final guess. Thanks for the feedback, I don't really know why it does that but I will look into it in future releases. Scene 'Level2' couldn't be loaded because it has not been added to the build settings or the AssetBundle has not been loaded. Last minute I had a bug that I could not figure out, I ended up remaking the scene but it seems like I forgot to add it to the build settings. This would be a nice tool for math teachers who are introducing their students to statistics; it's also helpful for doing division in your head and keeping a running tab, so I could totally see this being at home in something akin to Brain Age. Not my cup of tea, but you did a great job with the logic! I did find one bug I'd like to report, too: when I was on the lowest introductory level and passed it, the option to proceed to the next level of difficulty wouldn't register when clicked.